in the round, in St st after washing. 38" (96.5 cm) bust circumference and 19¼" (49 cm) long at center of back. 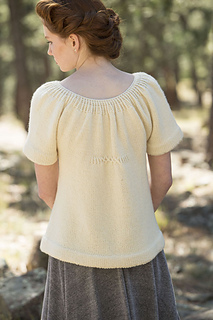 Simple white or natural linen peasant blouses were the inspiration for this little top. These traditional blouses were often elaborately gathered at the neck and shoulders and were often beautifully embroidered in either bright, colorful designs or in gorgeous, textural relief patterns in natural tones. 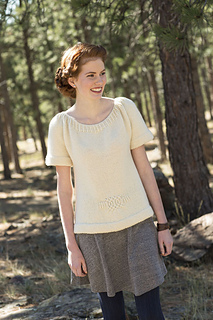 Knitted in the round from the bottom up, the yoke on the Emmi Yoked Top echoes these gathered effects. Simple traveling, or twisted, stitches usually found as decorative bands or detailing on mittens and socks have been used as features at the waist and on the back. These stitches also help give a gathered effect to the top. The hem, which is knitted deep and folded over, also has a small twisted-stitch detail. This not only adds a subtle pattern but also is a helpful guide for folding and stitching the hem. 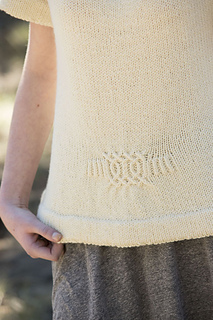 Knitted in pure wool on a circular needle, this top is washed in warm soapy water and left to dry flat on completion. Needles Size U.S. 7 (4.5 mm) 40” (100 cm) circular (cir) and set of 5 doublepointed (dpn). Adjust needle size if necessary to obtain the correct gauge. Notions Marker (m); cable needle (cn); holders or waste yarn; tapestry needle.